Physical characteristics: The helmeted guineafowl measures 20 to 25 inches (50 to 63 centimeters) long and weighs 2.5 to 3.5 pounds (1.15 to 1.6 kilograms). Males and females are not noticeably different in size. Plumage is mostly blackish gray with white spots and lines. Head ornamentation varies. Geographic range: This bird is found in Africa south of the Sahara; one population found north of the Sahara. Habitat: This guineafowl lives on savannas (tropical and subtropical plant community with some trees and shrubs among grasses and herbs) and in woodlands. 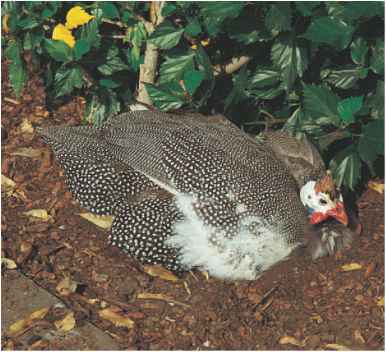 Diet: Helmeted guineafowl find food by pecking into the ground. Their diet consists of 90 percent insects, but also includes berries, seeds, and reptiles. They will eat whatever plants are abundant. Behavior and reproduction: This guinea is extremely vocal and social. Females make a call that sounds like "Buckwheat!" It lives in flocks of up to thirty-five but sometimes feeds in flocks of up to 1,000. Roosts from sunset to sunup. This species can run up to 20 miles (32.2 kilometers) daily. Pairs mate for life. The female lays twelve to twenty-three eggs, which she will incubate (keep warm for hatching) for twenty-four to twenty-seven days. The nest is a shallow hole in the ground protected by vegetation. Both parents feed and care for chicks. This guinea's breeding schedule corresponds with rainfall patterns. Helmeted guineafowl and people: Southern Africa's most popular land gamebird, bird hunted for sport. First domesticated by the ancient Egyptians. Perrins, Christopher. Firefly Encyclopedia of Birds. Richmond Hill, Canada: Firefly Books, 2003. Sibley, David Allen, Chris Elphik, and John B. Dunning, eds. The Sibley Guide to Bird Life and Behavior. New York: Knopf Publishing Group, 2001. Smith, Nancy. "Go Ahead, Get Guineas!" Mother Earth News (October 1, 2003). "Guinea Fowl." Honolulu Zoo. http://www.honoluluzoo.org/guineafowl.htm (accessed on June 9, 2004). "Helmeted Guineafowl." Kenya Birds. 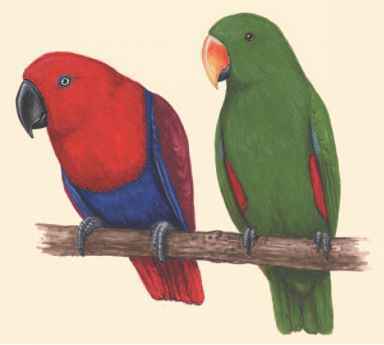 http://www.kenyabirds.org.uk/ h_gfowl.htm (accessed on June 9, 2004).